Probably the year of completion of the Black Forest Railway, built in 1873, today it is really a miracle that this building still stands. Its benefits for railway operation was eliminated already in the 1970s and its unfavorable access to public transport routes and supply lines spoke against a receipt. 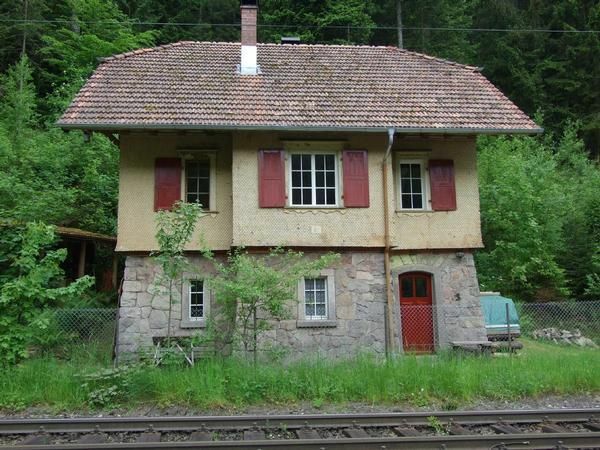 As this house came under monument protection, unlike numerous other signalman houses on the Black Forest Railway and thus the, operated by the railway demolition was prevented, is unclear. Taken in ruinous state, the little house has been lovingly renovated and lovingly furnished to provide with the aim of an authentic, historic atmosphere to send interested lovers on a journey. This concept is called "Holiday in the monument" and is so easy to find. The apartment is just over 80 m² in size. Downstairs is the bathroom, a cellar and in the former stables is a small workshop. Room, bedroom, Stüble, kitchen, and toilet are upstairs. Another small bedroom is in the attic. The floor plans are still original. In the room is a green historic tiled stove, which, as the wood stove is heated in the kitchen with wood. The kitchen includes everything you need to cook and to eat. The centerpiece is the wood stove, where you can cook delicious. On beds Three variants are available. A double. 140x200 in Stuble, a double bed 200x200 in the bedroom and two twin beds 90x190 in the bedroom. Additional cots are possible. The simple but authentic, facilities are the perfect setting for a relaxing holiday. With six people, the apartment is still occupied right. the apartment is heated so the fireplace and the hearth. The other rooms are heated if necessary, electrically. This means that not always and everywhere prevail usual temperatures. This circumstance leads to a kind bracing climate, which is accepted as the most healthy. In winter it is daytime properly equipped with sweaters and slippers and night with chubby pajamas and hot water bottle. The bathroom has a toilet, the sink an electric boiler and the bath and shower a woodburning stove Bath. This Badeofen heating the bath water and the actual bathing process becomes a ritual, slowing included. The prerequisite for an uninterrupted stay is a willingness to sit down with these special circumstances apart. Conditions that were common even 50 years ago in many households. Even things that are usually described with the comforts missing. There is no TV, no dishwasher and no electric coffee. There is little reception for mobile phones, a washing machine, a press plunger coffee maker, a kettle, a cooker, a world receiver and plenty of reading material. In the apartment is no smoking. The Bahnwärterhaus stands in a secluded location above the village Gremmelsbach, directly on the railway line. The exact position of the train kilometers in the direction of travel 60.13 Triberg left, between the Gremmelsbachtunnel and 3. Seelenwald tunnel. Those looking quartered at the track, involuntarily thinks of noise nuisance and disturbance. Went us just the same. But on this central mountain range, everything is different. One must know that the passenger trains are here new, short trains running very quietly and relatively slow and only about 10 seconds required to pass the House. And because of the forest sounds largely swallows, coming at the ear on Limited. Before and after the train there dreamlike tranquility. And then there is the night's sleep and that Monday-Thursday from 23 to 5:50, Fri / Sat 0:20 to 5:50, Sat / Sun 23:45 to 7:00 and so / Mo 00:20 until 5:30 AM. During this period usually runs no train. All those who have so far spent several days in the house say unanimously and without exception, that the trains no longer consciously aware at the latest on the second day. And so it is the new guests go. That I can promise. The house can be approached directly with real off-road vehicles. The path is very steep, narrow and rinsed by the rain. Add to this the fact that you can see the last 100m downhill reversing must. The solution: At the church in Gremmelsbach there is a landscaped park; the house is about 600m from here. There is a simple hand truck, with the transport of belongings is very possible. This situation is best seen athletically. - Local tax / tourist tax: per person and day costs of 2. 5 EUR (compulsory). - Pet: per animal per day costs of 7. 5 EUR (compulsory). The house can be approached directly with real off-road vehicles. The path is very steep, narrow and rinsed by the rain. In addition, there is the fact that you must be able to reverse the last 100m downhill.